So you know how to ride a bike, but you never actually ride? 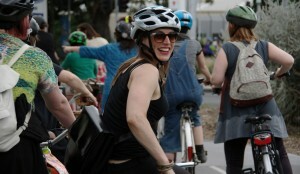 If you’re woman with basic bike riding skills but not the confidence to use them, then Pushy Women training is for you! We’re thrilled to be able to present the first of our Pushy Women Training series for the City of Yarra on Sunday April 10th! Pushy Women is a sociable and friendly training program for women who know how to ride but don’t have the confidence to use their bikes regularly. In this two and a half hour session you’ll get to know a group of fabulous local women just like yourself, all while honing the skills you need to safely get around by bike. We’ll start off in a traffic-free environment and practise all the basic bike skills you need to safely move onto the roads. There’ll be plenty of time to ask questions in a supportive and friendly group. Moving on to some quiet local roads we’ll learn how to use the bike lane confidently, navigate roundabouts, make hook turns and safely get across intersections. We’ll so be discussing what to do when you get a flat tyre, route planning around Fitzroy and beyond, road rules and there’ll be plenty of time to answer questions as they come up, whether they’re about bicycles, accessories, riding at night or finding friends to ride with. The Pushy Women Yarra training session is on Sunday April 10th at 10:00am in North Carlton. Suitable for women who have a bicycle and are able to ride a bike but wish to improve their confidence. All participants must be over 12 years old and any under 16 MUST be accompanied by a guardian who is also enrolled on the course. The course will be conducted in a traffic-free environment and on roads.